In June I had the chance to revisit the Colosseum, which is currently home to part of an exhibit on the Roman emperor Nero (reigned 54-68 C.E.). The exhibit, Nerone, running through mid-January 2012, is also staged throughout buildings in the Roman Forum and on the Palatine Hill. It's a great exhibit and I suspect that Nero himself would have enjoyed it immensely, especially seeing his portrait projected, larger than life, on the back of the Curia Julia. 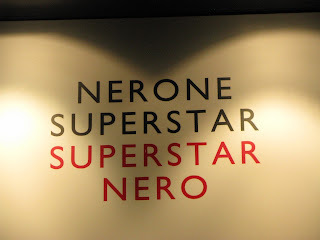 Or visiting the Temple of Romulus, where various cinematic Neroes were screened and Nero receives the epithet "Superstar" which he so longed for in life. 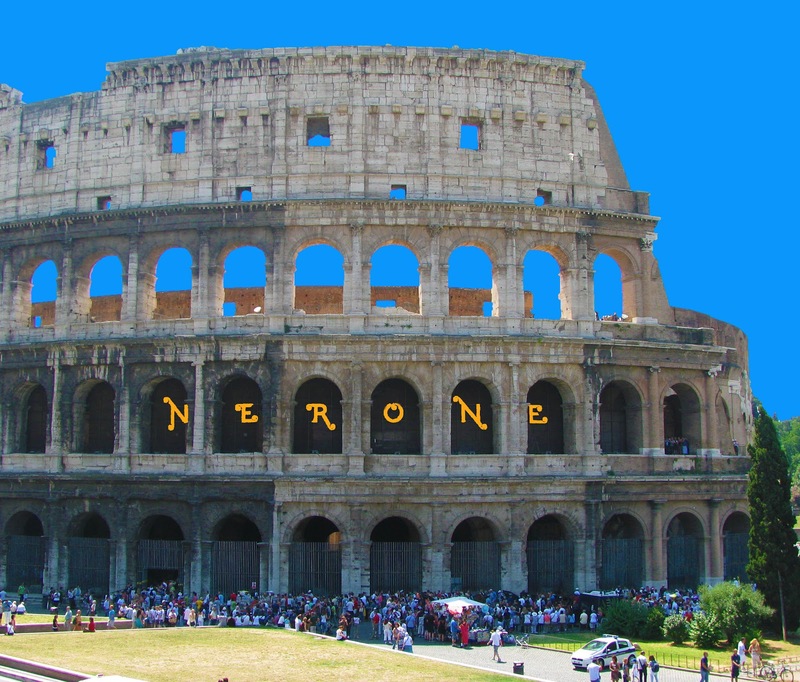 I don't know which part of the exhibit Nero would have liked best, but surely he would have felt a great deal of satisfaction in seeing his own name, Nerone, emblazoned across the facade of the Colosseum. And perhaps Vespasian (reigned 69-79 C.E.) and his sons Titus (reigned 79-81 C.E.) and Domitian (reigned 81-96 C.E.) are rolling over in their graves, having gone to such effort and expense to erase the memory of Nero and gain popular favor by building the Amphitheatrum Flavianum, as the Colosseum was known prior to the Middle Ages. The portion of the exhibit on display inside the Colosseum focuses on the great fire of 64 C.E. and Nero's Golden House. There is a certain, rich irony in this. Nero began construction on a vast, palatial complex, the Domus Aurea, stretching from the Palatine to the Esquiline, making use of land cleared by the fire of 64. The project was not popular and the biographer Suetonius (ca. 70-130 C.E. 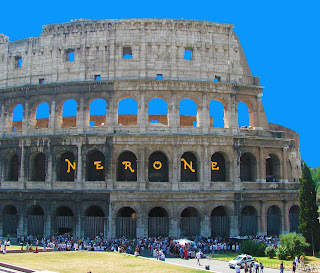 ), in his Life of Nero, reports that the saying "Rome will become a house..." (Roma fiet domus) was popular in verse and graffiti at the time. At the heart of the palace was a great park, with wild and domesticated animals; vineyards, fields and forests; and a lake, like a sea, surrounded by Disneyland-like, miniature cities. It was here that the Flavian emperors built their amphitheater, supplanting Nero's private, luxury palace with a venue for public entertainment and largess. "Here where the starry colossus sees the constellations close at hand and a lofty framework rises in the middle of the road, the hated halls of a cruel king used to gleam and in the whole city there was only one house standing. Here where the awesome bulk of the amphitheatre soars before our eyes, once lay Nero's pools....Rome has been restored to herself, and with you in charge Caesar, what used to be the pleasure of a master is now the pleasure of the people." So the Flavians are not just trumping Nero's gargantuan palace, but they are trumping every major monument in the world. And they are reclaiming Rome for the Romans. Now Nero has come home. I wonder if he would like his new landscaping. Nero did have a wooden amphitheater built in Rome during his consulship in 57 C.E. ; presumably it was built in great haste, as it took only a year to build. Suetonius also tells us that Nero planned to appear in the arena in the guise of Herakles, fighting a trained lion. What would Nero think of the Nerone exhibition? What would the Flavians think now that Nero has been resurrected in their greatest monument? With his name plastered across the arcades, larger than theirs ever was? Have you seen the exhibit? What did you think?